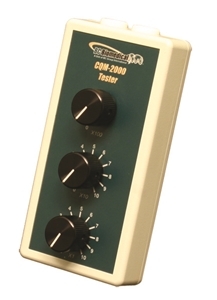 The CQM-2000 is used to test the Return Electrode Quality monitor of an Electrosurgical Unit. The CQM-2000 provides an adjustable resistance from 0 to 210 ohms in 1 ohm increments. The internal switches are ‘make-before-break’ type to ensure that the CQM circuit in the DUT does not see a momentary open condition. The CQM-2000 includes a calibration certificate.